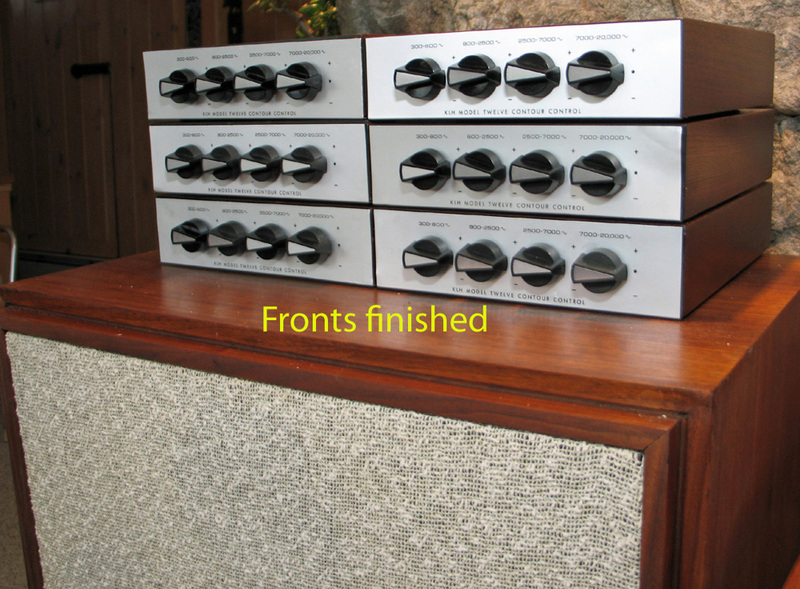 Kent has previosly posted his before and after cap mods to his own KLH Twelve Contour Control boxes. Quality workmanship can be seen in his work. Thank goodness no one needs to haul all 4 speaker enclosures around, Heh? Kent, on the inner mounting plywood board, at the top at about 1:00 o'clock is a penciled serial number, 3 or 4 digits, please, Kent, list if doing the mods, please. Also Robert, please provide Kent with the speaker enclosure serial numbers off the rear of the enclosures. 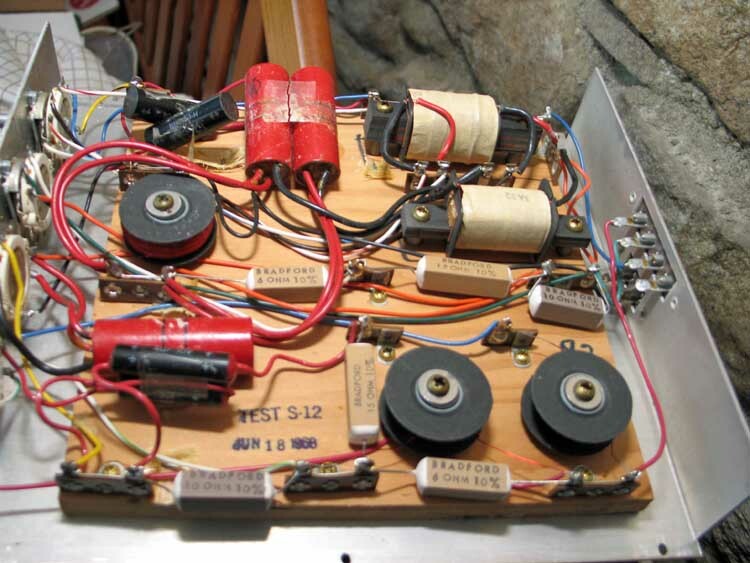 This is just to determine the number of KLH Twelves manufactured and possibly even a date from the caps or resistors or drivers. There is virtually no information about production numbers or mods from most manufacturers. Thanks for posting the serial numbers. Other than the former serviceman from KLH, we have mainly Andy and Kent who contributes to the KLH data. It appears now that at least 5,000 KLH Twelves were made, assuming that they used consecutive serial numbers. If Kent can confirm that these same numbers are also inside your crossover cases written in pencil we can start some sort of historical data. I am assuming that they serial numbered the crossovers to match their speaker enclosure. The former employee mentioned that the woofers were modified after they were found to bottom out and a bump was stamped on the back of the magnet for these later units. The KLH Fives, Twenty-Three's, and Twelves used the same woofers, usually marked 23 - 25 gram's on the cones. Perhaps over time, when a driver is removed from any of the enclosures, dates can then be posted as well. I am assuming that they clearly rubber stamped the dates on all their drivers. It will be a long slow process. Your first sentence pretty well sums up most classic manufacturers as well as KLH, Rob. At first I thought it was a sarcastic comment but I will accept it as not being sarcastic. You are incorrect about all of the woofers, though. They all look alike YES, are physically alike, NO. They used different weight cones between the various models. The Sixes used 18 - 20 gram cones. The Seveteen, Twenty and Thirty-Three another un-listed weight as of now. The M-12 test and 23 - 25 gram cone markings, usually marked on the cone front, sometimes marked on the rear of the cone, are pretty certain to be just for the KLH Twelve. They probably were interchangeable downward for the KLH Fives, Twenty-Threes and possibly others as well, in a pinch. Perhaps more information will be forthcoming in the future from a newer member. There was at least 4 or more different magnet systems as well. The voice coil size differences, I am not aware of, no data, yet. I never worked for a speaker manufacturer, I do not know exactly what they do when they re-design or discontinue a product. They may have just torn up the old drawings and started over again. Here, locally, when Heathkit shut down, all onhand manuals, for just one example, were dumpstered. A former employee salvaged all that were available and is still hoarding them. All Heathkit branches and the factory may have done the same thing or not. Anyways, historical documents were destroyed. Too bad this type information was not sent to a museum of sorts. Due to a communication problem, my big bros set outside his house a carton of accummulated hifi data, including AR-LST, AR-10 pi and AR-3A improved blueprints, just for me. I did not find them and all the data went to the dump, forever. KLHMark brought the KLH pair of driver sheets to the table last year, thank you, Mark. 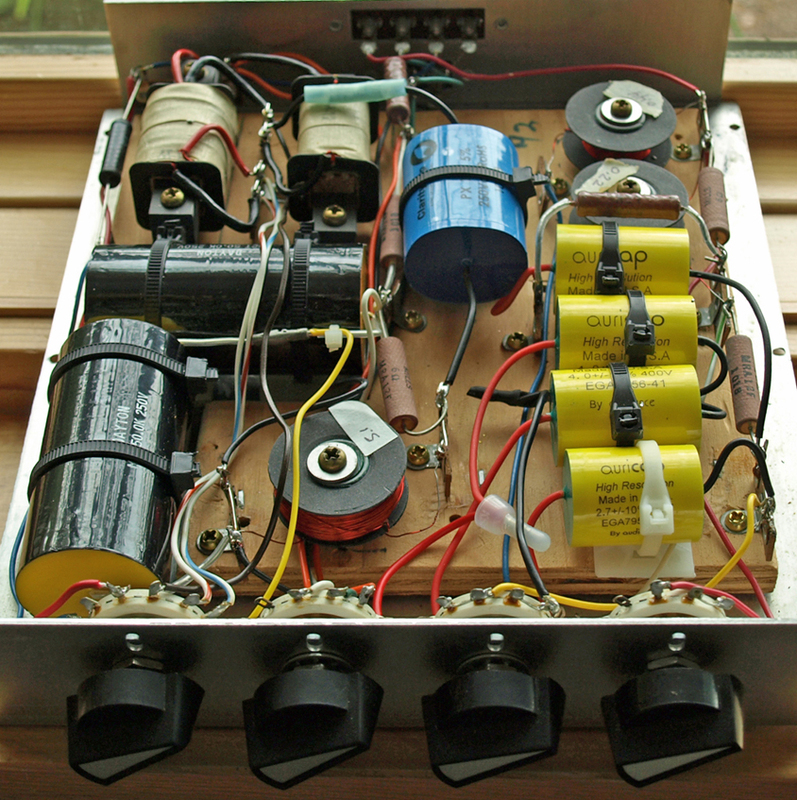 As a side note, try finding a factory original introduction sheet to the KLH Twelve. So far no factory documents have surfaced, but may still do so in the future. Try finding an original Heathkit original AS-2 owners manual. Photo copies are being sold on ebay but the originals are as scarce as hen's teeth. 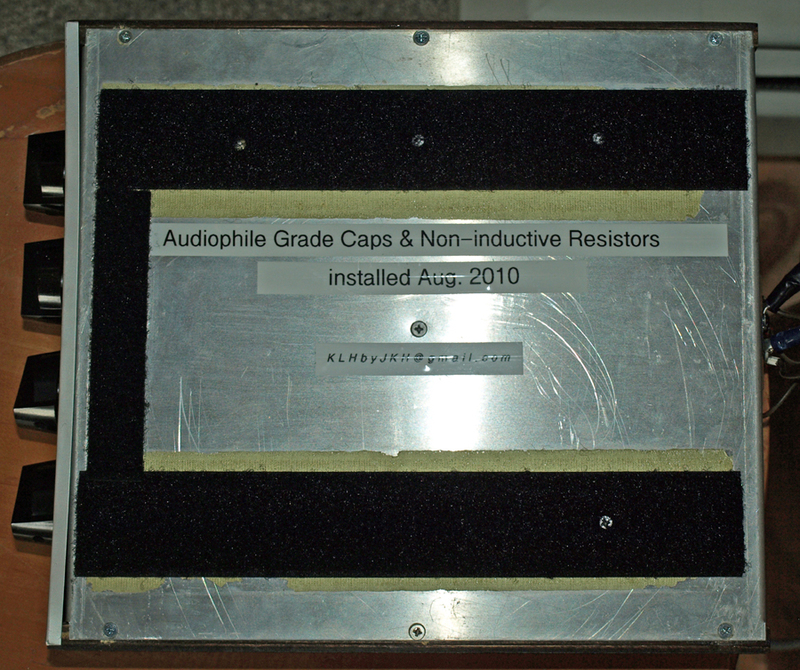 All electrolytic caps were removed. There were several dual-value caps. KLH apparently used whatever they got the best deal on. 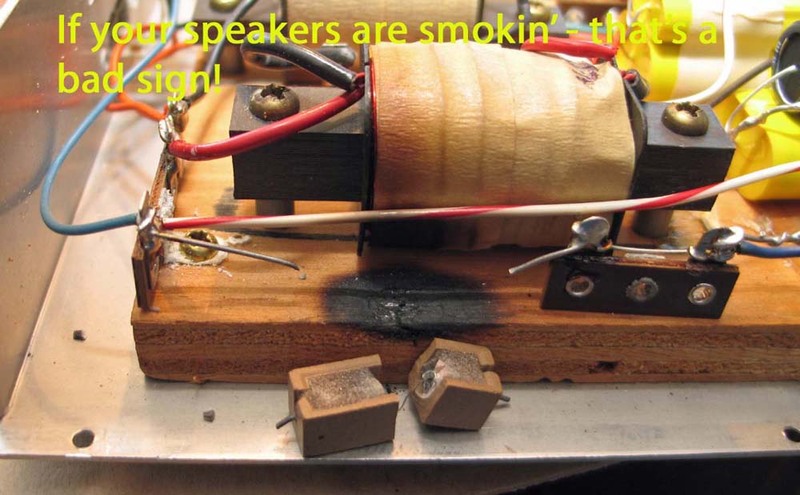 If your speakers are smokin' -- that's a bad thing. 5 ohm 5 watt wirewound resistor was cracked in half, the plywood base was charred! 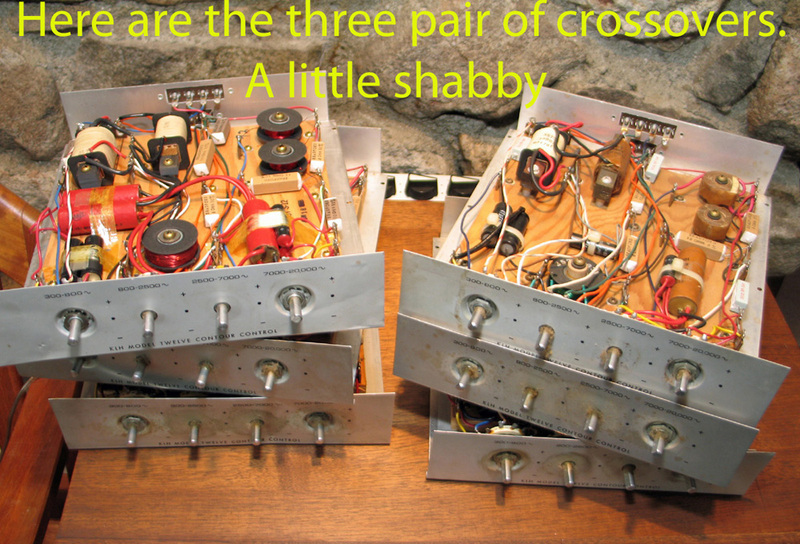 The other crossover from this pair also had a cooked 5 ohm resistor. ROCK ON! All new mylar film caps, except the 50uF value (no room! ), which is made up of a 10uF mylar and a 40uF NPE. The 16uF value is made up of 10 + 5 + 1, and the 4uFs are 3 + 1. Those are the values we had to work with. 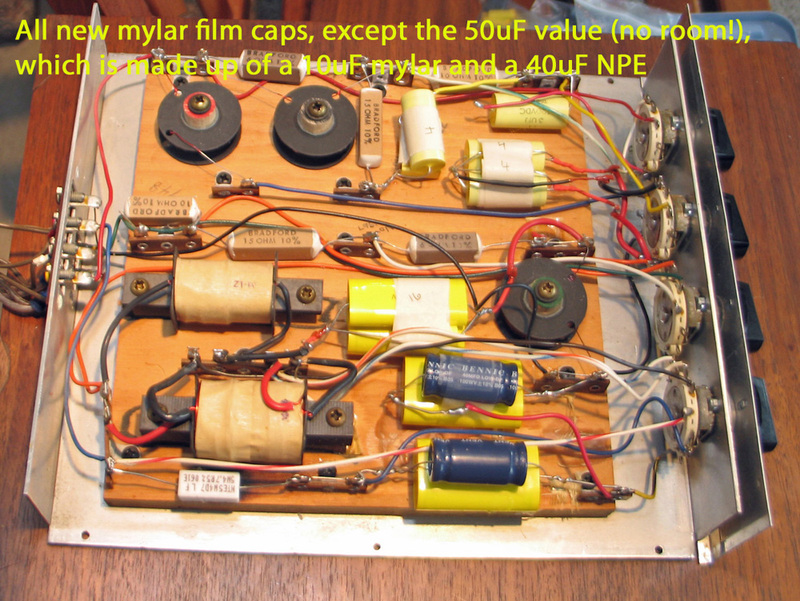 Originally we had "bundles" for the 50uF value, consisting of 33uF NPE, 10uF mylar, 7uF mylar. Too big-- the nice external xover cabinets have limited headroom. Some of the cabinets were “sprung” so they had to be pulled together to put the screws in. Great job you did again. Thanks for the update on the cap values as well. Interests:Guitar, Vintage Hi-Fi, raising 2 teenage boys. Hey guys, I'm getting ready to start buying parts for the recap on my KLH 12 Contour boxes, I only have one box right now but am going to go ahead and order enough for two, using JKent's parts list. This discussion is a little old, does anyone have any updates or advice before I get started? Is it advisable to go ahead and recap the 12's also, my guess is yes, any advice on that subject would be welcome also. Thanks for the compliment....but I'm probably more of a relic than any kind of treasure! Anyway, always glad to help out. It's one of those things that makes a hobby worthwhile. KLH caps were generally crappy, so there is every reason to undertake that task without delay. 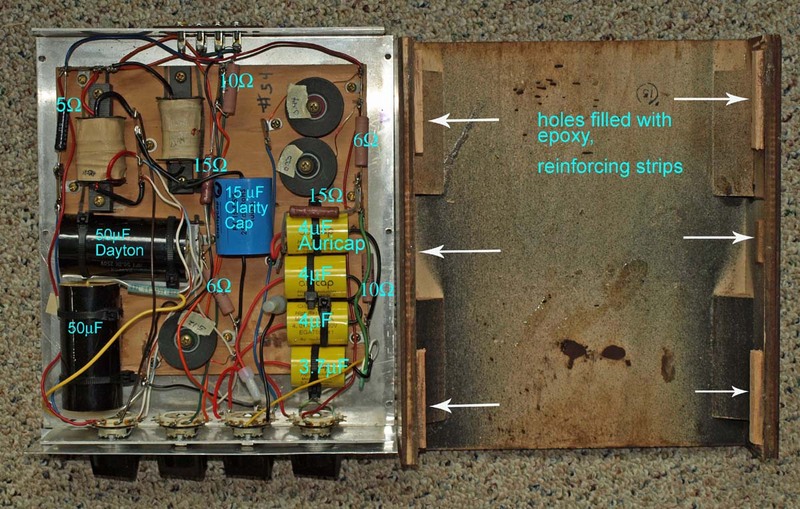 Examine the switches, which appear to be similar to the KLH 5 switches, and use a liberal amount of Deoxit on them. I'm still having some problems with the switches in a pair of 5's, and I have run across similar switches in KLH 23's that could not be adequately cleaned. The lesser KLH models, like the 17 and 20, actually have simpler, more reliable switches. One thing worth mentioning again--be sure to examine all of the resistors for scorching or cracking, and replace as needed. If I were doing this again I would probably just replace all of the 5w resistors with 10w. YMMV. It sounds like your woofers may have been connected out phase with each other (connected in opposite polarity), and canceling each other out.....if not at the cabinet terminals, then internally at the crossover. If you are sure you had your speakers connected properly (+ to + and - to -), I would check the crossover you removed for proper polarity. Of course my 1st thought is "your incompetent technician screwed up one contour box" but you said it used to work, then stopped, so maybe something did blow out. Since you have at least 3 pair of boxes, I guess you're OK for now. Actually, I did not replace the resistors (see the photo in post #34). Only replaced ones that were obviously scorched. Probably should have just replaced them all, like I did in your Fives but the common wisdom is "wire wound resistors don't go bad." Guess if you've SEEN some scorched 5-watt resistors your opinion should change! Putting the Clarity Caps in the Twelves will be a challenge but it could be fun too. It may just be a matter of "raising the roof" on the boxes--making them taller. A little carpentry job. Apparently just getting warmed up. If you go back to post #34 you can see Rob's three pair of Model Twelve contour boxes, with a mix of no-name film caps and some NPEs for the 50uF caps. Here is the re-do of pair #2. Rob wanted all high-quality film caps. The selection was based on two considerations: Quality and physical size. Also replaced all the resistors with new Mills 12w non-inductive resistors. Fitting the 50uF Daytons was the biggest challenge. Thought I'd have to "raise the roof" of the contour box or put the caps outboard, but by cutting away part of the 1/2" plywood base inside the box, it provided just enough room. Also had to shift some of the inductors and tie points slightly. Photos below show the contour box before the "first" recap, the plywood base notched to accept the Daytons, and the finished contour box. One finished, one to go. Here is a shot of the insides, labeled. 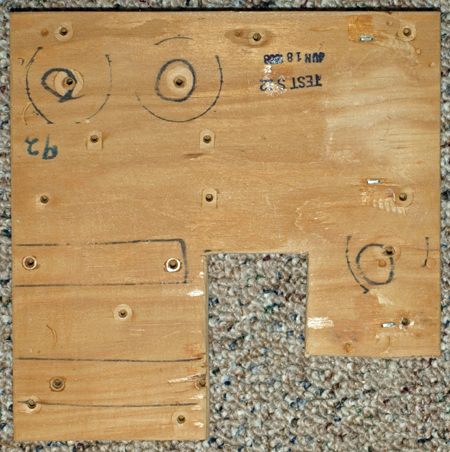 The 6 screw holes on the lid were filled with epoxy and reinforced with small strips of scrap wood, then redrilled. The Velcro strips on the bottoms had to be removed to remove the plywood, so new Velcro was installed. Also added an extra strip across the top (these hang on the back of each speaker) to help support the added weight. The Clarity cap in the center was originally installed with a cable tie but the mounting block added too much height, so now it is stuck on with double-sided foam tape. I have never put much stock in esoteric caps--no golden ears here--but my Twelves with these upgraded xo boxes sound great! Hard to do a real A/B comparison, but subjectively I think they sound better than they did with the mylar caps, and they also seem to sound better than my AR2ax + VMPS sub setup. YMMV. Switches were sprayed with De-Oxit and the screw terminals in the back got a little dielectric grease. Would JKent or anyone be interested in doing their magic on my contour boxes? sure Steve. I'll send an email. It's been quite a while since this thread has been active, but I thought I'd chip in with the serial numbers on the pair of Twelves I recently picked up: they are 5227 and 5235, higher than the previous ones mentioned here. I haven't taken drivers out yet to look for date stamps.